LASIK is the most commonly performed and well known vision correction surgery. Using an excimer laser, the doctor re-shapes the cornea (the front external surface of the eye) so that images are focused to the correct spot on the retina (the light receptor of the eye). The success rate with this procedure is excellent, with most patients achieving 20/20 vision or better upon completion. During the procedure, the doctor first administers a local anesthetic via eye drops, so the patient will feel no pain during the surgery. A speculum (gentle eyelid holder) is then placed over the eye to prevent the patient from blinking. Next, the surgeon cuts an extremely thin flap from the outer layer of the cornea, using a femtosecond laser. The flap is folded to the side, and the excimer laser, programmed with the individual map of the patient’s eye, removes excess tissue with quick pulses of concentrated light. This process usually takes less than a minute. Once this is done, the doctor folds the flap back into place and surgery is complete. In the past, a microkeratome (a small blade) was used to create the flap. Advances in femtosecond laser technology now make it possible to create a precise flap with a blade-less approach. This technology was approved by the FDA in 2007 and is the current state-of-the-art standard of care. Therefore, our surgeons will only offer you the most sophisticated laser technologies with the blade-less and all-laser approach. The patient may go home shortly after the procedure; however, someone else must drive or alternate transportation must be arranged. Patients will be asked to get lots of rest, avoid any strenuous activities, and avoid rubbing the eye area for the first week after surgery. There are follow up appointments with the doctor 24 to 48 hours after the procedure and periodically over the following weeks and months. Vision should dramatically improve in the first few days following surgery. The patient often may return to work in a day or two. Initially vision will be very hazy but will gradually improve over the next month. You may experience a "shadow" or ghost image around objects. Some patients complain about "halos" around lights. These are all temporary and will go away over the next few weeks. The vision in one eye may seem better than the other. This is very normal! Everyone heals differently, we do not heal symmetrically. Your vision will fluctuate on a day to day basis. You may feel like your vision is OK one day and horrible the next. This is common and will improve over time. Driving should be done at your own discretion. Most PRK patients find that they can drive themselves in for their one week follow up, but DO NOT ATTEMPT TO DRIVE UNTIL YOUR VISION HAS IMPROVED SIGNIFICANTLY!!!! 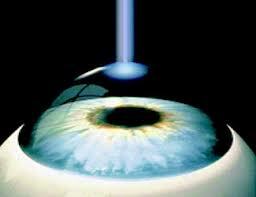 PRK (photorefractive keratectomy) uses the same excimer laser as LASIK in order to re-shapes the cornea. However, instead of using the laser to treat under a corneal flap, the treatment in PRK goes right on the corneal surface. Since no flap is made, PRK allows the surgeon to treat thinner corneas or higher corrections without going deeper into the cornea. In addition, PRK can also remove irregularities on the surface as well as superficial cornea scars. Unlike LASIK where the vision recovers immediately, PRK involves several weeks of healing. In the first week, the surface cells heal under a protective, clear, soft bandage contact lens. Although there is little or no discomfort during the procedure, patients may experience light sensitivity, tearing, and pain in the first 1-4 days in the recovery process and your doctor will prescribe pain medication. The bandage contact is removed 1 week after the procedure and at this point, most patient are able to drive and return to work. Between week 1 and month 3, the quality of vision continues to improve as the surface continues to smooth and even out. Irregularly shaped corneas or irregularities in the corneal surface. Corneal scars from injury or infection. Desire to avoid a LASIK flap due to extremely active lifestyle or profession. Before and during surgery, your eyes will be numbed with anesthetizing eye drops. Although some patients experience discomfort during the procedure (e.g. a pressure sensation), you should not feel any sharp pain. You may experience some tearing, burning, light sensitivity, foreign body sensation and a stuffy/runny nose for the first several days after surgery. Closing your eyes and napping or just sitting in a dark room for a few hours should lessen these symptoms. Non-steroidal agents, such as Motrin, Advil, Tylenol, etc. are recommended for relief of discomfort. Additionally, we will give you a prescription for Percocet that you may choose to use if needed. Vision will be cloudy, like looking through a bathroom window, on postoperative day 1, and will continue to fluctuate the first few weeks after surgery. Most patients can drive one week after surgery. However, backup plan should be arranged. Please note that approximately 5% of patients will require an enhancement or "tweaking" approximately 3 to 6 months after surgery to obtain their best visual outcome. Although at times unaware, some patients may have significant dryness after PRK/PTK. Constant blinking for clarity or extremely hazy vision is usually the affect of dry eyes especially if you are at least one month post surgery. Using artificial tears four times a day for a few weeks usually helps with these dry eye symptoms. However, if the dryness does not improves over the first few weeks, other drops are available (over the counter and prescription) and/or ointments that are very helpful. This can be discussed at any of your postoperative visits. If your insurance company offers coverage for the procedure you are having done, our insurance staff will assist you in filing your claim. Most insurance companies do not cover Laser Vision correction. People who have a high deductible health plan (HDHP) can use a Health Savings Account (HSA) to pay for elective services like LASIK, PRK, and other laser eye surgeries. Also, for some people, LASIK or PRK eye surgery can be a tax deductible medical expense. LASIK and PRK are both excellent investments in your personal well being. For this reason, we believe that financial considerations should not be an obstacle and we provide financing through CareCredit. CareCredit is a special credit card specifically for health care costs and offers no introductory rates, prepayment penalties, or application fees. They offer No Interest Payment Plans if your account is paid in full within 6, 12, 18, or 24 months. Apply now at CareCredit to see if you are eligible! Still have questions? 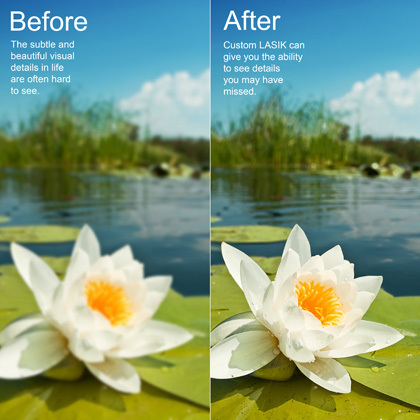 Click here to view our LASIK & PRK FAQs page. To receive additional information in the mail, Click Here.